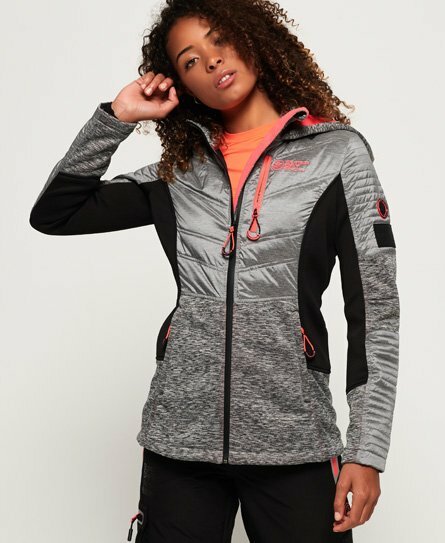 Superdry women’s Softshell hybrid jacket. This light tech jacket is a great addition to your snow wear collection this season, the light, soft fabric provides easy movement and comfort during activity. This jacket combines a variety of different techniques throughout to create a complimentary fit on the body. The softshell hybrid features a single zip fastening with ergonomic adjusters throughout, elasticated cuffs and a media pocket. In addition, this jacket has coated zips to keep you dry, Superdry branded zip pulls, a Japanese inspired logo on the placket, Superdry badges on the sleeve and two Superdry logos on the chest and back of the shoulder.